The Jones Brothers’ legacy and love for Catalina is clear, even after they passed on. Both were world-class sailors. Brad Avery, who is currently a sitting member of Newport Beach City Council and well-known sailor, previously told Catalina Island Conservancy Times Thad Jones was one of the most sought after crewmembers for sailing competitions. Thad held the record for most transpacific races from Los Angeles to Hawai’i, having completed 22 races. Thad, who was attending the Catalina Island School for Boys at Toyon Bay (now gone), was also the first person to map out and complete a cross-Catalina hike. Through Avery’s efforts with Catalina Marineros, this is how the Thad and BZ Jones Cross Catalina Hikes were born. 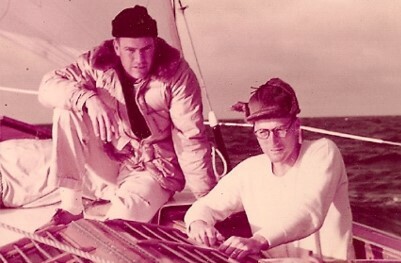 In addition to their sailing feats, the brothers loved Catalina Island and were always willing to volunteer in its name. They were supporters of the Catalina Island Conservancy, a nonprofit organization founded in 1972 to be a steward for the island through “a balance of conservation, education and recreation.” Hiking is now one of the draws of Catalina, bringing to light the natural beauty of the island’s terrain as well as exploring its unique ecosystem and plant and animal species. Each year, surviving family members still take part in this special hike and it is a major fundraiser for the Conservancy. For more information about BZ and Thad Jones Cross Catalina Hikes, visit catalinaconservancy.org.